Village Bakery trailblazer Alan Jones wins award for outstanding contribution | News by Wales Express News, People Before Profit! A trailblazing pioneer of the bakery industry has been hailed for his “immense contribution” over nearly 60 years. Alan Jones, chairman of the hugely successful Wrexham-based Village Bakery, was presented with the Outstanding Contribution Award the industry’s Oscars, the Baking Industry Awards. 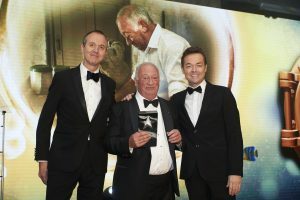 The honour was bestowed at a glitzy ceremony at London’s Park Lane Hilton Hotel which was hosted by the popular TV presenter Stephen Mulhern. The good news kept on coming because the Village Bakery also earned praise from the judges after winning the Bakery Product of the year 2018 with their free from Belgian Chocolate Twists as well as being highly commended for their customer focus. Mr Jones, 73, said: “I feel deeply honoured to have been given this Outstanding Contribution Award and the fact that it has come from my peers in the baking industry makes it all the more special. “Throughout my career I have stayed true to my roots as a craft baker and this is something that has stood me in good stead over the years. After leaving school at the age of 15, Mr Jones started out as an apprentice baker at Scott’s Bakery in Netherton, Liverpool, where he gained a City and Guilds qualification and then a National Diploma in baking and confectionery. Along the way he won a host of awards for baking and confectionery including a North West Area Technical College award for baking the best Hovis loaf . He completed his apprenticeship in 1963 and later worked for Scotts bakery before first joining Cookson’s Bakery in Lytham and then Country Maid in Saltney where he was appointed as bread production manager. In 1964 he and his father, Harry, bought what became the Village Bakery in Coedpoeth, near Wrexham, from the Edwards Brothers who had established the business 30 years earlier. Mr Jones transformed the small back street bakery with five employees into a multi-award winning business that has three bakeries with a £45 million turnover and 450 staff supplying high quality products to some of the best known names in UK retail as well as making their own acclaimed branded goods. Three years ago the Village Bakery’s state-of-the-art Baking Academy and Innovation Centre was officially opened by Prince Charles and the Duchess of Cornwall. The company is now investing £12 million in converting and extending the former Caparo Wire factory, close to their two existing bakeries on Wrexham Industrial Estate, into a production facility for a new range of gluten free goods. When it opens in December it will be the most advanced bakery of its kind in Europe and will cater for the explosion in demand from customers. Two of his sons, Robin, the Managing Director, and Projects Director Christien, are taking the family-run company to the next level, building on the firm foundations laid by their father. Mr Jones, has also been the driving force in creating a six-acre nature reserve in a 17th century broadleaf woodland next to their two bakeries on Wrexham Industrial Estate. The bakery is working with the North Wales Wildlife Trust and has given them a 50-year lease. As a lifelong conservationist, Mr Jones practises what he preaches on his 35-acre small-holding. There he has created five ponds, planted 4,000 trees and laid three quarters of a mile of hedge to encourage wildlife. Although after six decades as a master baker, he is no longer involved in the day-to-day running of the business, Mr Jones remains very much as the wise patriarch offering sage advice and guidance as the Village Bakery thrives and prospers. Son and managing director Robin Jones said: “We are thrilled that Dad’s immense contribution has been recognised at our industry’s Oscars. The honour is richly deserved. “Being innovative and forward-thinking is now part of our DNA and when Dad saw a good opportunity he took it. “But the recipe for success has always included staying true to core principles about quality baking and quality ingredients. “Dad has always said to Christien, Tim and I that we must always focus on baking and not have interests in other industries like some of our competitors. “We’re craft bakers and we’re a business of bakers run by bakers and that makes the difference. “It’s a family firm and that’s been important as well because we’re very agile. We’re dynamic. We can look at opportunities and make a decision within hours, and that’s been important to our success. It was a sentiment echoed by Christien Jones who added: “Dad gave us the opportunity to stand on our own two feet at a very early age, and also gave us lots of control, to make some mistakes, but thankfully also to make some good decisions and that freedom has let us build on what he created. “The Baking Academy and Innovation Centre was his idea, he could see that we hadn’t got skilled bakers we needed to train more bakers and grow our own. It was his support and insistence on having these wonderful facilities here so we can train the next generation of bakers. “He will leave a legacy, a legacy of more skilled bakers in this world because he’s given us the opportunity to train them. “That is paying dividends, we’re now reaping the rewards of that investment and that vision. “The Village Bakery is what it is today because of his vision and he has laid the foundations for a wonderfully exciting future.